I wore this to court today and to some depositions in the afternoon. 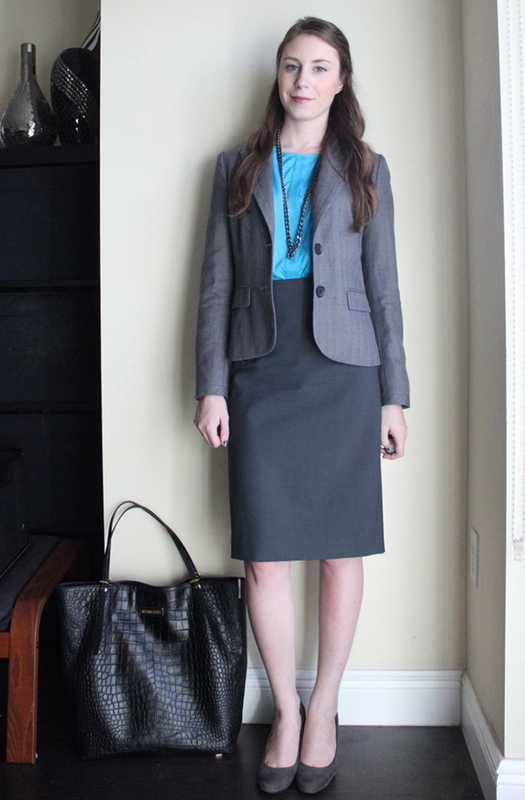 This blue silk Ann Taylor top is one of my favorite blouses in my closet. You wouldn't know it by the amount of times it's appeared on the blog though, or by knowing me in real life either. I think I've worn it 4 times total! Wore it here last. I love the blouse, but it's the dreaded "dry clean only"! It also wrinkles like cray when I tuck it into skirts. So even if I didn't sweat a TON today (it was 95 when I checked my car thermometer, ugh) I still couldn't re-wear it because of all the wrinkles. Ugh, I hate dry cleaning. I also feel like dry cleaning in Miami is insanely expensive. My BF has a dry cleaners in his building in Chicago and it's like $1.50 for a men's shirt! Why can't it be that cheap for women's blouses? Do you have any high maintenance items that you love but don't wear as often as you'd like? Women's dry cleaning is always more expensive, because it has to be ironed by hand. Men's stuff is pressed on a form. Ask your BF to ask what his cleaners charges for a blouse. What you are paying doesn't sound high to me at all, and I am in a low rent part of the country. woolite makes "dry clean" kits you can do at home. i think they're around $7-8 and they work in the dryer! ive heard of those before but never tried them. it's probably time! 15 - 20 for a blazer is insane. $3.50 for a blouse is a little more than I pay. I thought you had said $2.50. Of course, I am in a much cheaper part of the country than you are. they come with 6 cloths and each can clean up to 4 garments. so possibly 24 home dry-cleaned items for a little more than a starbucks drink. :) worth it, in my opinion!